This is my best friend, Jennifer (Spules), and me at a Harvest Party (aka-the church party we went to a few days before we went trick or treating:). I was a bum (why?) 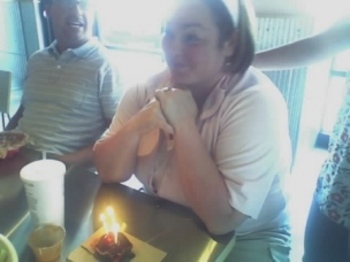 and she was a baby…btw, she wore those pj’s for years! We met in 3rd grade at our church’s Missionettes group and immediately connected. 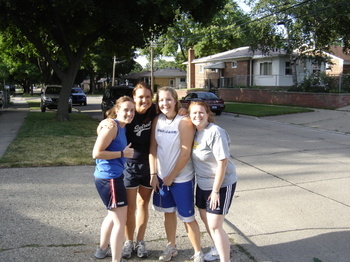 Jen and I were apart of a group of girls that called each other BFF’s…we had bracelets and everything! 🙂 Just about every Sunday after church we were either over at my house, Jen’s house, or our friend Eileen’s house. Of all the girls that I used to spend hours doing my hair and putting my makeup on with, Jen’s the only one that stuck with the Forever part of BFF. I could write for pages about this friend of mine, and although at the age of 28 I have a plethora of God’s gracious gifts of friendships, Jen will always be the friend that’s known me the longest, and the one that’s seen me through the most…sounds selfish, doesn’t it? She’s been God’s gift of friendship to me for 20 years. and I intentionally didn’t live together when we first went away to NCU. We said it was because we wanted to be sure to meet more people…secretly I think Jen just knew I was a little bit messier than her and didn’t wanna chance it:) Hah! Her first roommate was kinda messy too…but after some agreements, we ended up having our first apartment together our 5th and last year of college. We were the last ones to make it into an apartment that year and ended up in a tiny, tiny studio apartment that wouldn’t hold beds if we wanted it to. We bought Coleman sleeping cots on clearance at Target and slept on those:) You had to go through our closet to get to the bathroom. Oh, what an interesting apartment that was. Chris Woelfle, the apartment guy at the time, vowed to never rent that apartment to more than one person ever again and had us move for the 2nd semester to a more normal place. And so we graduated together for the second time. That summer, my best friend married her new best friend:) I received the privilege of being a Maid of Honor in her wedding, which meant the world to me. Currently I carry around, in my purse, a little white Bible that I carried down the aisle that day…I get to think of Jen all the time…that little Bible means so much to me! So much of our relationship cannot possibly be recorded in even a series of blog posts, but I am reminiscent for one main reason…Jennifer called me a couple weeks ago to tell me that she’s having a baby! She said that I get to be an Aunt Mim again! Yay! I’m still bubbling over with excitement over this announcement and I am amazed at how gracious God is to intentionally place people in our lives…sometimes for a season…and sometimes forever. So, you’re off for the summer..
I’m a teacher. And because people are kind and interested, they ask me what I’m up to this summer, since I have no school. It’s a valid question, and one that I must answer quite often. I’ve already been to Philly to visit family, and Guatemala for a missions trip. 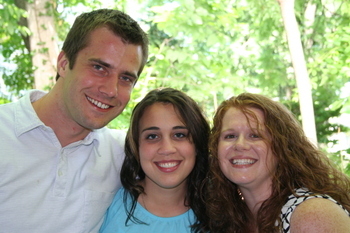 I’ve hung out with three really fun and amazing interns too. There are projects that I’m working on, both for school and for church…I’m not bored. My last couple weeks have kept me pretty tired, although I’m not completely sure why. Life, relationships and projects haven’t all gone on without a hitch, but nonetheless, I have been having a great summer. ecially if you know her, It’s the kind of funny that you might end up saying, "I almost peed my pants!" Here’s the picture of four of us who were there that day. 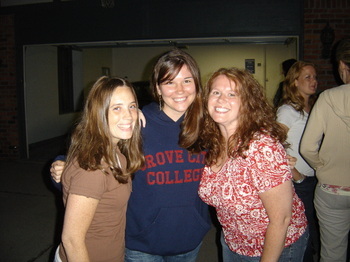 Oh, and I can’t forget my two great PA friends, Jamie and Leah. This past weekend I had the honor of being with my friend as she got married. 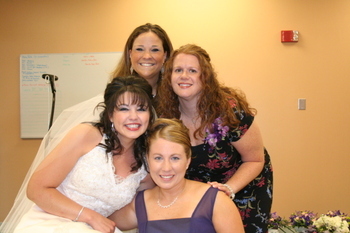 This is Christina, Jen, Anne Marie and me on the big day. So Jen and I had some people from her church over on Friday night. They had something going on that night, so it was kind of late by the time they got here. A few of the guys decided to put on some of their own music and they turned it up…it took me a whole song to tell them to turn it down because it was too loud.